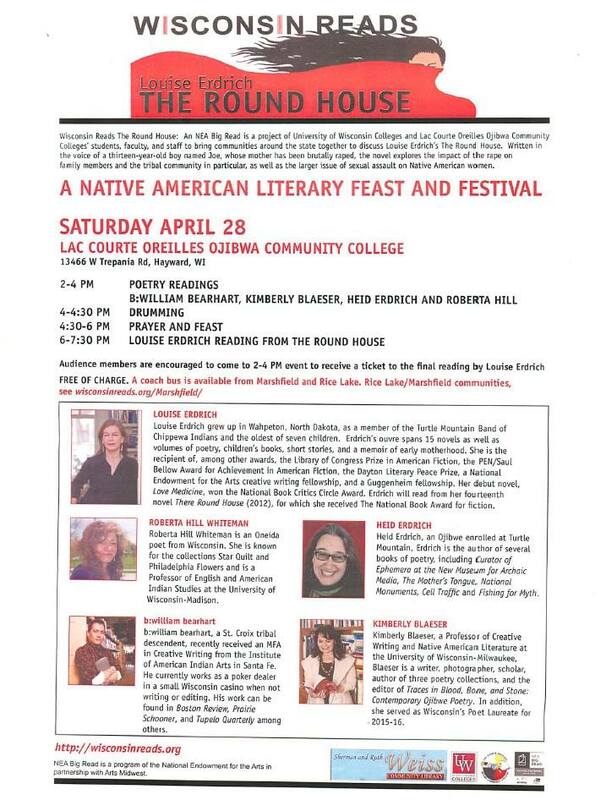 An NEA Big Read will take place at the Native American Literary Feast and Festival this Saturday at LCO Ojibwa Community College in Hayward, Wisconsin. Saturday’s festival will bring BEI Emeritus Fellow Roberta Hill, author Louise Erdrich and poets William Bearheart, Kim Blaeser, and Heidi Erdrich. Readings are schedule from 2 to 4 p.m., drumming from 4 to 4:30 p.m., a prayer and feast from 4:30 to 6 p.m. and a reading by Louise Erdrich from 6 to 7:30 p.m. There is no charge for tickets. Louise Erdrich’s book “The Round House,” which received the National Book Award for Fiction in 2012, explores the fine line between justice and revenge in a Native American community. The book is told from the perspective of Joe Coutts, a 13-year-old Native American boy growing up on a North Dakota reservation who experiences the trauma of a brutal sexual assault on his mother. The book describes the impact of the assault on the boy, his stepfather and the small community where they live, as well as the legal system that prevents many rapes from being prosecuted on tribal lands.